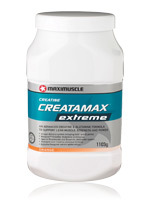 Buy 2 Creatamax Extreme for 65,00EUR each! Take your physique and performance to a new level. When our researchers first sat down to come up with a formula that could offer far greater results over plain creatine, we never thought the product would become No.1 in the UK so quickly. To keep Creatamax Extreme at the top, we have worked hard to keep upgrading the formula to ensure it offers the latest in creatine technology and a product that delivers the right ingredients at the right dosages; something which very few brands deliver. Its unique formulation contains a potent glutamine and creatine blend amongst other unique exclusive nutrients, now including fenugreek extract, which when combined with a weight training programme, is proven to increase your muscle, size and strength. Creatamax Extreme contains dextrose, which is proven by studies to increase creatine uptake for superior results over creatine alone, together with an exclusive to Maximuscle:- a unique high alkaline pH booster phosphate blend, which reduces conversion to the ineffective variation, creatanine. Creatine is one of the most researched sports nutrition nutrients ever sold. Even in dosages of up to 21g for 2 years, creatine has not been shown to cause any adverse effects. Our substantial expertise in this area, led to us being asked to oversee the independent commissioning of the final research paper for the European Foods Standard Agency (EFSA) and EU directives on sports nutrition. Loading: Mix 1 level scoop (33g) of Creatamax Extreme with 200ml of water, and take 4 times a day for the first 4-5 days. Maintenance: After loading dose, take 1 scoop (33g) twice daily., once in the morning and once after training or in the afternoon. Marathon runners, cyclists or anyone wanting endurance and not bulk, should take just 1 scoop daily, with no loading dose.